The full moon was still reflecting in the puddles from last night’s downpour as I walked up to Columbia Rd before dawn to speak with young Albert Dean, at his double pitch selling cut flowers at the Western end of the market. With his knitted hat pulled down over his ears, hopping from foot to foot and rubbing his hands together enthusiastically in the cold, this wiry young man with sharp eyes informed me proudly that, although he has only been working there full time for about five years, the stall has been in his family for four generations. Albert Dean is the fourth Albert Dean since his great-grandfather to run the pitch on this site – as long as the market has been here – which means that at any time during the last century you could have come and bought flowers from an Albert Dean at this street corner. The current Albert Dean has been working on the stall regularly since he was seven and now that his father is in semi-retirement, his energy motors the business into the future. “I don’t see why not, I’d like to think so!” he declared with an eager grin, when I asked if he expects to be here his whole life. “It’s in the blood, I don’t know anything different,” he announced with a hint of absurdity at his rare horticultural pedigree. Rising at three in the morning, Albert drives down to Columbia Rd with a lorry full of flowers each Sunday, setting up at five-thirty and returning home again with an empty lorry. Taking Monday off, Albert works for the wholesale side of the business based at Golfside in Cheshunt the rest of the week. Flower orders are sent off on Tuesday, for the coming weekend at Columbia Rd and all the wholesale customers, while Wednesday is Albert’s second day off in his curiously syncopated routine. 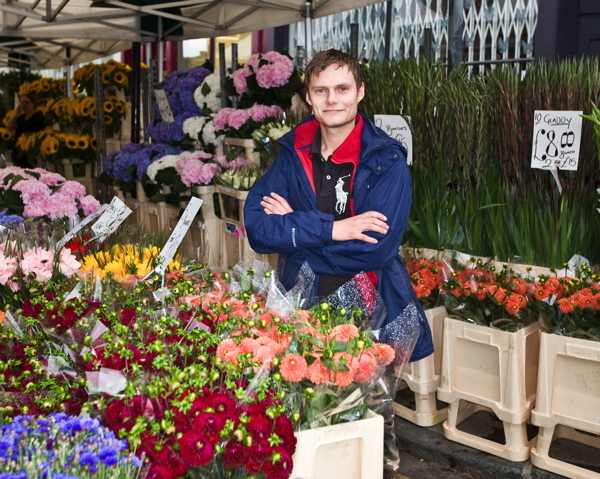 Then on Thursday, Friday and Saturday, Albert is sending out deliveries to restaurants, corporate clients and freelance florists, as well as preparing for Sunday too, including supplying other stalls in Columbia Rd. “We’re about as cheap as you can get,” he assured me with a toothy grin. With Halloween approaching, Albert has Chinese Lanterns (Physalis) on sale alongside a fine variety of decorative foliage. “That’s what all the restaurants are ordering this week!” he confirmed with all the inborn swagger and breezy confidence befitting the fourth generation Albert Dean, standing on the street corner that is his birthright. One hundred years of Albert Dean – truly astonishing.